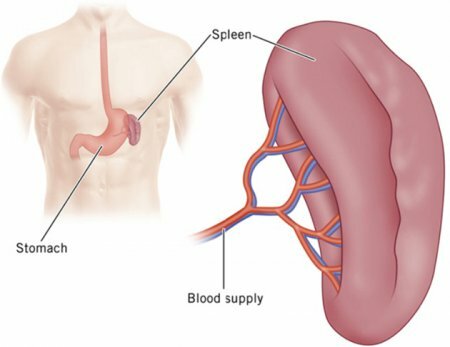 The spleen is a brown, flat, oval-shaped lymphatic organ that filters and stores blood to protect the body from infections and blood loss. Protected by our ribs, the spleen is located between the stomach and the diaphragm in the left hypochondriac region of the abdominal body cavity. The splenic artery branches off from the aorta and the celiac trunk to deliver oxygenated blood to the spleen, while the splenic vein carries deoxygenated blood away from the spleen to the hepatic portal vein. A tough connective tissue capsule surrounds the soft inner tissue of the spleen. Spongy inner tissue within the spleen contains many tiny blood vessels and hollow sinuses that store blood. The spleen can release its stored blood into circulation to replace blood lost during a traumatic injury. Many platelets are also stored with the blood in the spleen to help form blood clots to prevent further blood loss. Around the vessels and sinuses of the spleen are regions of red pulp and white pulp with a marginal zone in between. - The red pulp regions contain many net-like reticular fibers that filter worn-out red blood cells from the blood flowing through the spleen. Captured red blood cells are digested to recycle the iron and protein components of hemoglobin. - The marginal zone between the red and white pulp acts as a filter to capture pathogens in the blood and pass these pathogens on to the white pulp. - White pulp regions of the spleen are made of lymphatic tissue containing macrophages, T lymphocytes, and B lymphocytes that destroy pathogens in the blood and produce antibodies. The spleen may enlarge during certain infections due to an increase in the number of white blood cells, captured pathogens and antibodies inside the spleen. The spleen is not a vital organ – its functions are useful but not essential for life. Red bone marrow, the liver, and lymph nodes can complete the filtration and blood recycling functions of the spleen in its absence. Because it is not a vital organ and is so soft, spongy, and vascular, damage to the spleen is almost always treated by its complete removal. Untreated damage to the spleen can quickly lead to massive internal hemorrhaging and eventual death.